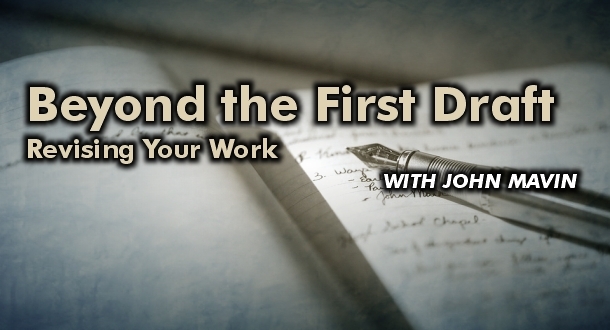 On Saturday, April 6 (from 2:00 - 4:30 p.m.), I'll be presenting Beyond the First Draft: Revising Your Work for the Tri-City Wordsmiths at the Terry Fox Library in Port Coquitlam (2470 Mary Hill Road). Space is limited and library registration is required (just call 604-927-7999), but if you'd like to learn a method of rewriting to take a first raw draft to a polished story, I invite you to join us. 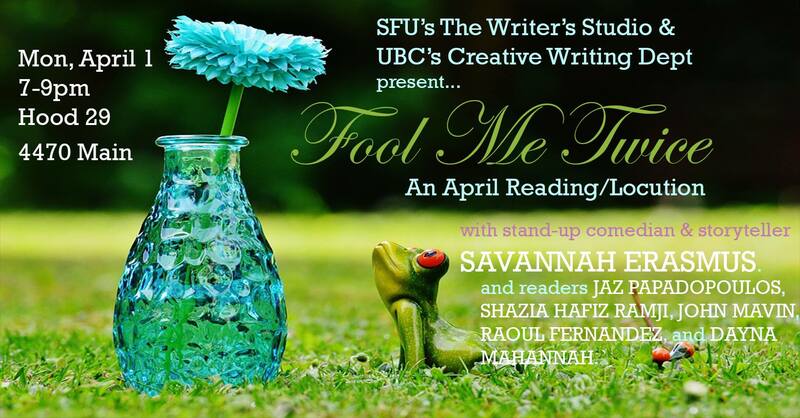 On Monday, April 1, I invite you to join me, Savannah Erasmus, Jaz Papadopoulos, Shazia Hafiz Ramji, Raoul Fernandes, and Dayna Mahannah for the joint Locution/TWS Reading Series event Fool Me Twice. We're on from 7:00 to 9:00 p.m. at Hood 29 (formerly Cottage Bistro) at 4470 Main Street in Vancouver, and the evening (headlined by Savannah Erasmus--who's also a stand-up comedian), should be a lot of fun. 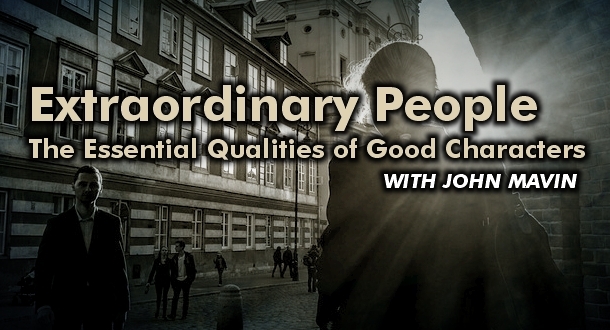 On Saturday, March 30, I'll be presenting Extraordinary People: The Essential Qualities of Good Characters at this year's Creative Ink Festival. If you find yourself in the Delta Burnaby Hotel and Conference Centre around 11:00 a.m., I'll be in the Firenze room and I invite you to join me. More specifically, I'll be talking about how most readers look for stories about interesting (and preferably unique) people doing fascinating things in the most surprising of ways they'll always remember (as opposed to stories about ordinary people doing ordinary things in the most ordinary ways they'll soon forget). This session examines the essential qualities of all good characters, giving you the tools to populate your fiction with compelling and memorable people both heroic and villainous (and everything in between). Hope to see you there. On March 26 at the North Vancouver District Public Library (from 6 - 7 p.m.), author Rae Knightly and I will be sharing writing prompts and advice for April’s Camp NaNoWriMo--a more laid-back, less intimidating version of many writers' Novembers. Pick any kind of writing goal you want and come for the motivation and encouragement. Adults, teens and tweens are welcome. Drop in or call 604-987-4471 (ext. 8175) for more information. 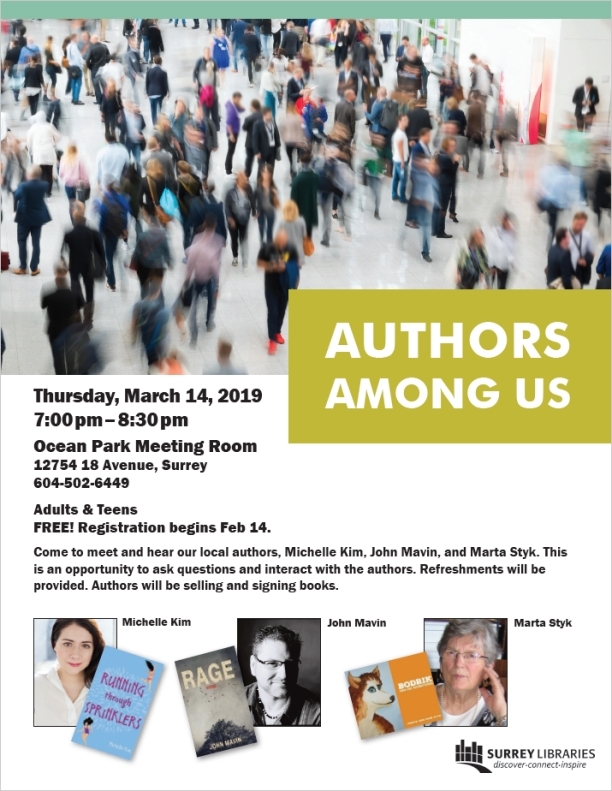 On Thursday, March 14, I'll be in participating in a panel at the Ocean Park Library in Surrey along with Michelle Kim and Marta Styk. The panel, which will be moderated by Jennifer Wilson, is called Authors Among Us, and is an opportunity for people to meet some local authors, ask us questions, hear us read from our work, and maybe even pick up a signed copy of our books. The event is free, registration is now open, and, oh yeah--I'm told there'll be refreshments. Just click on the poster for details. Tuesday, February 19--I'll be at the ACT Arts Centre in Maple Ridge, British Columbia and I invite you to join me with Golden Ears Writers as we talk about the words your characters say. We'll also discuss how dialogue differs from real speech as well as share tips on how to use dialogue to effectively establish your characters and advance your plots. This is an adult event, but mature teenagers with an interest in writing are welcome. No young children, please. No charge to attend.